A website can use the widget to collect subscribers in different ways. In this example you can see the custom prompt on the left, the floating action button on the right and an additional subscribe button in the sidebar. 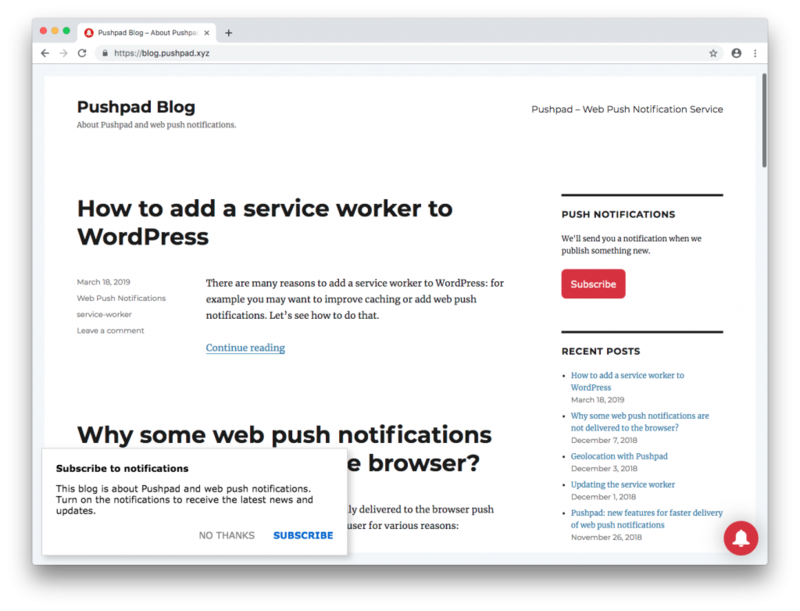 You can use the Pushpad widget to grow your list of subscribers that receive your web push notifications. You can turn on all the components or use only some of them. You can also customize the text and appearance from the dashboard. Based on some usability guides, using the widget offers a better user experience compared to displaying the permission prompt directly on page load. One of the advantages is that if the user deny permission to the custom prompt you can display it again, whereas the permission prompt of the browser can be displayed only once. However if you use the widget the user will need to perform more clicks in order to subscribe compared to a permission prompt on page load… You can use the Pushpad stats to see what method gives you more subscribers. If you want to start using the widget you can check out the docs. The widget is the easiest solution to collect subscribers using the best practices. The WordPress plugin (version 2.0) now uses the Pushpad widget by default.